Who Picked Queen Elizabeth II? Queen Elizabeth II was Heff's #3 pick in dp03 for 0 points. Queen Elizabeth II was Dummy Hand's #1 pick in dp07 for 0 points. 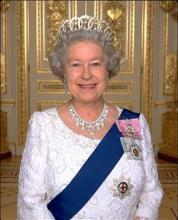 Queen Elizabeth II was Brian's #10 pick in dp08 for 0 points. Queen Elizabeth II was Terry D.'s #8 pick in dp09 for 0 points. Queen Elizabeth II was Terry D.'s #10 pick in dp10 for 0 points. Queen Elizabeth II was Doug's #6 pick in dp11 for 0 points. Queen Elizabeth II was Heff's #9 pick in dp12 for 0 points. Queen Elizabeth II was Doug's #9 pick in dp16 for 0 points. Queen Elizabeth II was Doug's #1 pick in dp17 for 0 points.